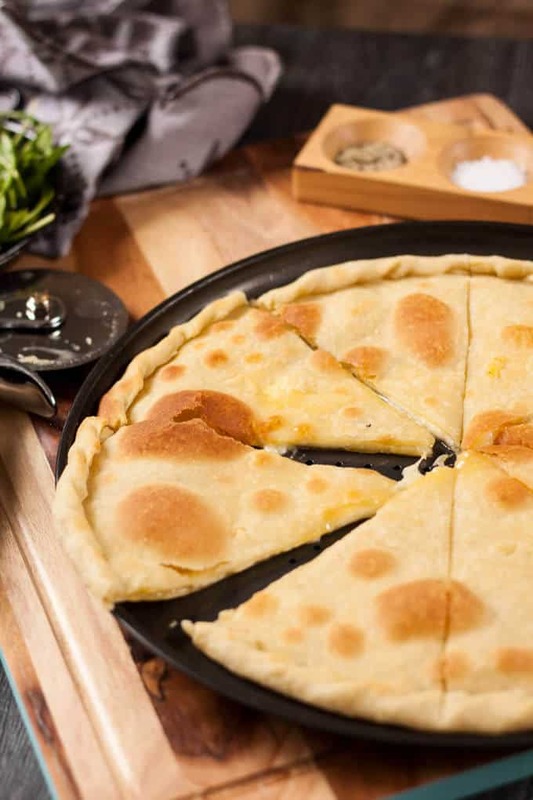 Not like focaccia bread but instead two paper thin layers of dough, filled with oozy melted cheese. This is recipe No.2 in my ‘Food from our Honeymoon’ series of posts. Nothing like focaccia bread that you may know well, when this turned up at our table we were in for a treat. 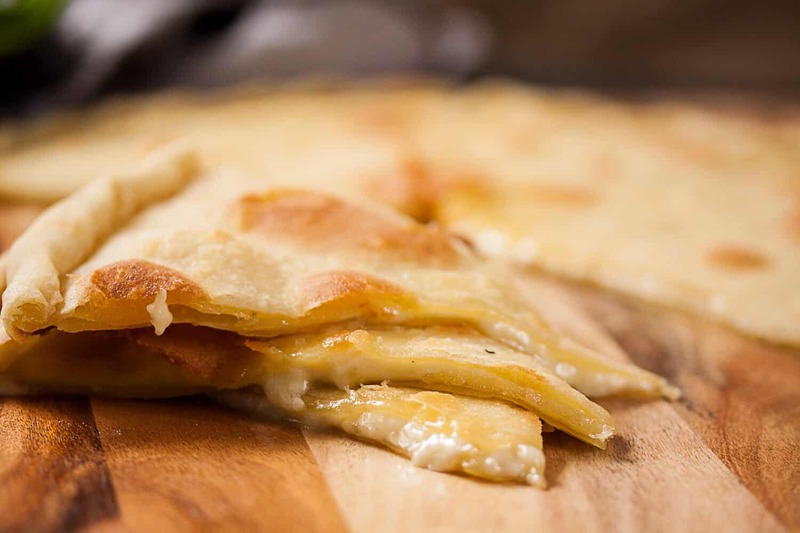 Full name Focaccia Di Recco alla Crescenza, this is two layers of paper thin dough (yeast-free) filled with oozy melted cheese. ‘Crescenza’ being the name of the traditional cheese of choice. So, Genoa was our last stop in Italy. Neither of us had ever been to Genoa and we were under the impression it was a ‘quaint fishing village’. Tripadvisors main picture is of a largish bayside town which turns out to be Boccadesse. Close by but not Genoa. Click here to pin this for later! Haha. No, no! It turns out Genoa is actually the 6th largest city in Italy and the capital of Liguria. It’s a huge, very old port city boasting Europes largest aquarium. Had we not been expecting something very different we probably would have enjoyed it much more but we were looking forward to a more relaxing little seaside town. You know, one of those towns where the ocean spray fills the air and restaurants line a beachside promenade. Umbrellas over the al fresco tables, blue skies, birds flying along the waterline…. Nope! Big port, cars, busy people going about their busy days. A massive aquarium in the shape of a large ship with it’s very own Captain Jack out front. Wait, wha??? Yep. Ok, so my research may have foundered a little on this one but I did a monumental amount of research for our honeymoon, so one drop of the ball. Meh! My bad! Moving on. Genoa actually had some amazing architecture. Not the ancient history of Rome but certainly the centuries old buildings were very similar, with their amazingly intricate and sometimes imposing facades. Being that Genoa was our final Italian destination before we jetted off to New York City for the last part of our honeymoon, we decided to splash out on a flashy dinner. Why not? Plus it seemed like a nice way to say “Goodbye and hope we see you again soon”. So, the hunt was on for a nice, traditional Italian Restaurant. I’m saying this in an Italian accent and waving my hands around right now. Not that you can see but I am. Go on, give it a shot, you know you want to. It was a tricky little place to find but, once we did, the service was outstanding and the food too. The waiter offered us the focaccia to start, with a wry smile, and suggested we’d never seen anything like this. Props to him. He was right and it was delicious. 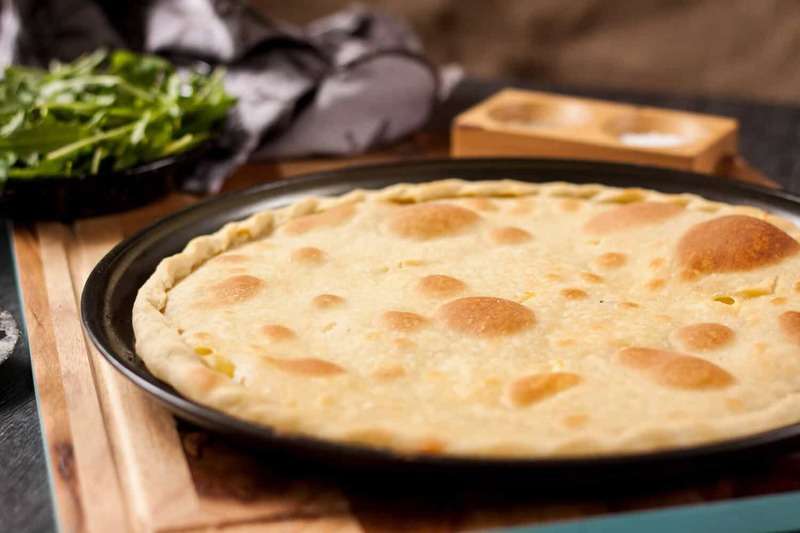 Focaccia di Recco is best eaten fresh and hot. Straight out of the oven in all it’s cheesy glory …. Yum! The traditional crescenza cheese was sadly nowhere to be found back home but I instead settled on a combination of brie and fontina. The reason I chose these was quite a long and twisty cheesy research journey so I won’t bore you with it ? Genuine Focaccia di Recco lovers, don’t hate me. I did the best I could. Anyway, the texture worked perfectly. It was a slightly stronger cheese flavour than the one I remember in Genoa but delicious all the same. Give it a go. You definitely won’t regret it ? Recipe adapted from the one here on Food 52. In a bowl, mix together the water, oil, salt and flour. Once it comes together, turn out onto clean surface and knead until smooth and elastic – about 10 minutes. Don’t add any extra flour. Grease a bowl and place the dough in. Cover with plastic wrap. Place in fridge for 3 hours. Preheat the over to 250C / 480F (230C fan forced). Lightly grease a pizza tray. Turn dough out onto a clean work surface. You shouldn’t require any extra flour due to the oil content in the dough. Cut the dough into 4 pieces. Place 3 pieces aside under plastic wrap. Roll the first piece as thin as you can get it. You can also use your hands to gently stretch it out. Hold it up to allow the weight of the dough to stretch itself. It should be 1mm or less thick and you should be able to see your hand through it. Lay the sheet of dough over the pizza tray, hanging over the edges. Use a spoon to place small dollops of brie over the sheet (only use half of the brie). Sprinkle over half the fontina. Now roll out a second sheet of dough, just as thinly as the first and lay it over the top of the cheese. Press down all the way around the edge of the pizza tray to seal the two pieces together. Use a knife to trim off the excess all the way round. Now use your thumb and two fingers to curl the edge over then press down, repeat this all the way round to completely seal the edges. Brush the top with some olive oil. Tear 4-5 little holes in the top layer of dough to allow steam to escape, then sprinkle with salt. Bake in the oven for 7-8 minutes until the top has large golden bubbles. Slice and serve straight away. Then prepare the second. 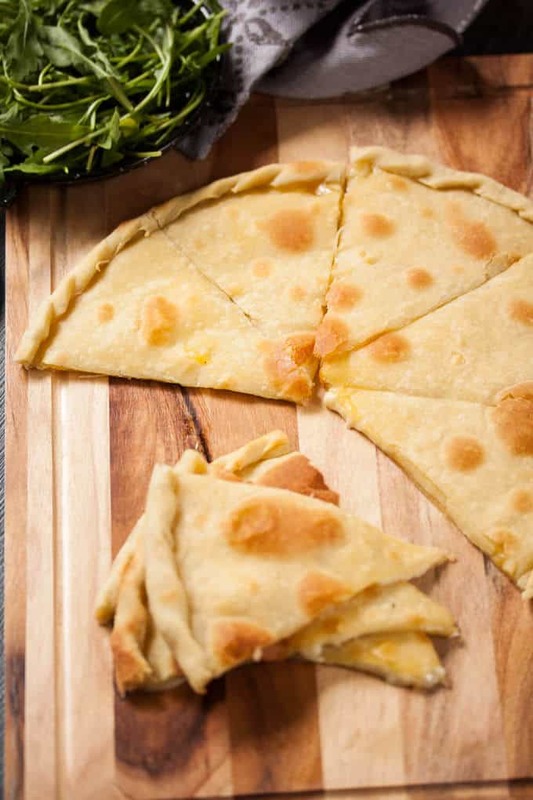 The traditional cheese used in Focaccia di Recco is crescenza, so if you can get your hands on that, definitely use it. From my research on different cheeses, Taleggio should also work. The dough can be frozen, so if one focaccia is enough, just wrap the other half of the dough in plastic wrap (2 layers) or place in a zip lock bag and place in the freezer until required. Wow, another beauty created ! Thank you so much ! Ciao ! Thanks 🙂 Hope you give it a try.